Sometimes women do not want to be seen twice in the same outfit, especially at a special occasion and if the same group of people will be in attendance. Celebrities often feel pressured to wear a new outfit for each event. The gossip mags may criticise a celebrity for wearing something that the public has previously seen her wear. Sometimes you have a friend or family member who is the same size. If you are really lucky they have a similar style to you. Perhaps you can borrow items, but you will need to to be willing to lend items in return. Be really careful not to damage or stain anything you borrow and return it promptly, washed and ironed or dry cleaned. I recall having a lovely yellow full length dress with black cuffs and bodice which I wore to a ball back in the early seventies. A couple of friends borrowed it. As it was an item I wore only two or three times I was happy for others to get use from it. If you feel the need to have a wide variety of outfits, op shops are your best friend, especially if you don't have the cash to buy lots of clothes new or if your social conscience won't let you. Some thrift shops have a good selection of items suitable for special occasions. Some have fancy dress too if you are off to a party where you are expected to come in fancy dress. These days there are more businesses hiring out women's clothing. Luxurious accessories and designer bags can be hired too. Items are often posted out and a back up dress is sometimes available if desired. Clothing hire companies have details on their websites. 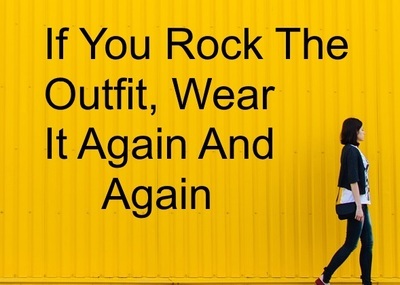 A different jacket and footwear can really alter the look of an outfit. The clever use of accessories can dress an outfit up or down. Does it matter if you wear the same outfit numerous times? Whether you are getting ready for a special occasion, work or time off it is a matter of personal choice whether you like to be seen in lots of different outfits or are happier in something you have worn many times before.